This picture was sent to me by an old friend asking to identify the warship entering harbour. She must be a foreign naval vessel, and she is being saluted by a gun salute from the saluting battery. any one knows the answer? As it looks as it is uncertain what the name of this armoured cruiser is, I am changing the classification of the photo from "mystery ships " to harbour views "Malta Harbour c.1900." Where that battleship is moored has changed considerably in these 120 years, it is now called Magazine wharf because it used to house underground naval ammunition ,now it has a grain silo and also a cement silo adjacent. Magazine wharf with the adjacent Laboratory Wharf is the usual berth for the vehicle carriers calling regularly. The top left side of the picture now is the largest graving dock built by the aid of China in the 70s. And great changes have been enacted even due to WW2 bombing which destroyed buildings, bastions etc. The two funnels ship in the background could be a battleship. With thick and closed spaced funnels, could be one of the 6 DUNCAN class battleships which were launched in 1901. All of them served in the Mediterranean fleet around 1903. Could also be a CANOPUS, LONDON or FORMIDABLE class. 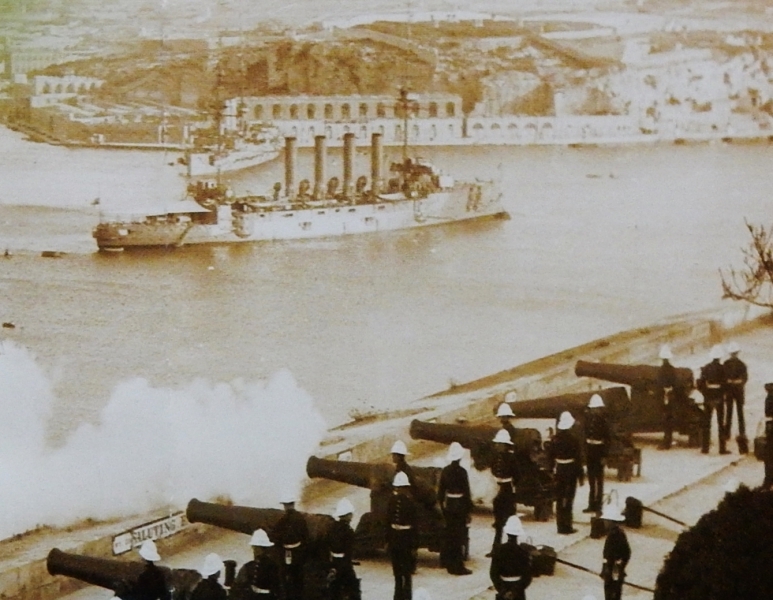 .Yes she looks to be moored to a mid harbour.Could be any of the 6 CRESSY class , passing through Malta, such as the SUTLEY on way to Souda Bay,Crete or even ABOUKIR as part of the Med fleet in 1902 to 1905 and 1907 to 1912 and BACCHANTE which was Med fleet flagship during 1902. If they are saluting an arriving ship, it is probably off screen - the cruiser appears to be moored to a buoy. The ship in the background seems to have two funnels. There is another warship in the background , could this be another CRESSY class armoured cruiser? Thank you rarcand. as you quoted there were other CRESSY class cruisers with no bands on the funnels, so this leaves the identity still unknown. maybe some other readers will come up with other results.Still thank you my friend. There were 6 Cressy class cruisers, the SUTLEJ (1899), the CRESSY (1899), the ABOUKIR (1900), the HOGUE (1900), the BACCHANTE (1901) and the EURYALUS (1901). According to the 1914 edition of the Jane's Fighting Ships, it seems there was an identification code by a pattern of bands on the funnels for this class of cruisers. Since there is no such band visible on this picture, it could be the EURYALUS which bore no bands. But, I also found some other pictures of some other CRESSY class with plain funnels. Thanks miraflores, I will look up the link you provided. Can you possibly put a name on this armoured cruiser Santos or any one else? Probably an armored cruiser of the Cressy class. This photo has been shown 899 times since it was added to the site.